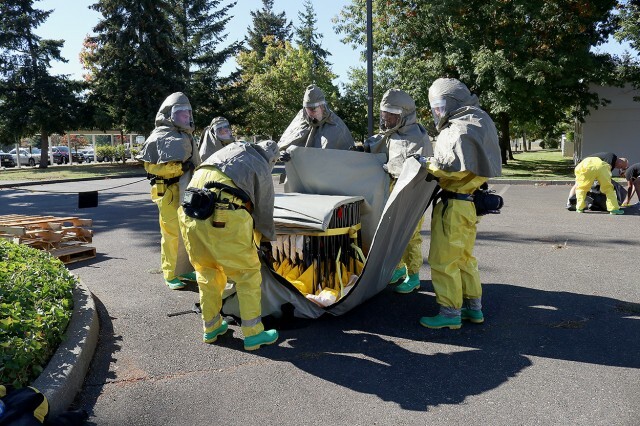 JOINT BASE LEWIS-MCCHORD, Wash. -- If there's an accident involving a fuel truck on Interstate 5, first responders would perform a rudimentary decontamination of anyone involved. 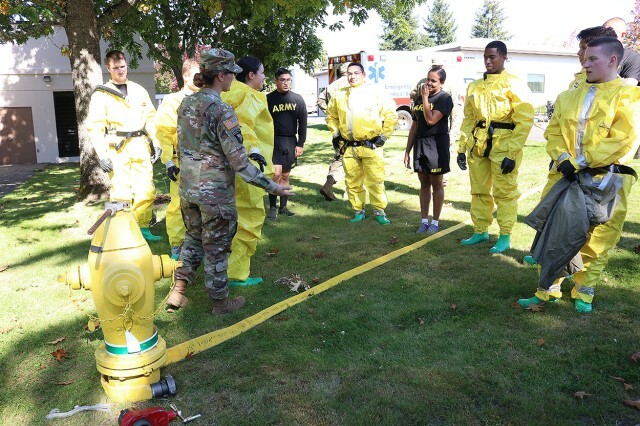 Then, for those needing to be seen as patients at Madigan Army Medical Center or requiring a more thorough cleaning, the patient decontamination team from Madigan would be called into action. 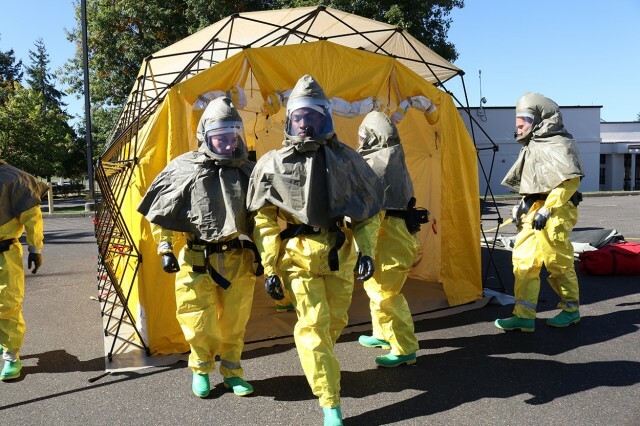 Suit up, set up the tent, hook it up to the hydrant and hose the people down. That is the basic, and important, task of the "decon" team. 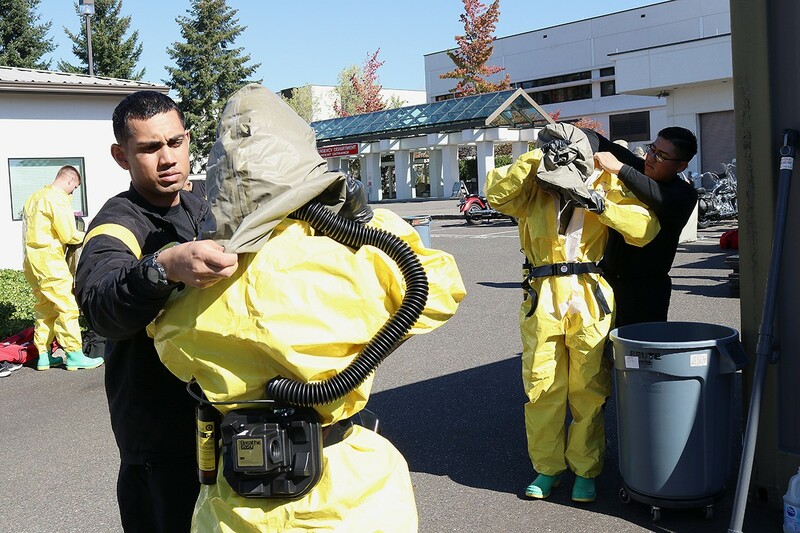 "This is the first training that I actually conducted and led," said Staff Sgt. Ryann Davis, the noncommissioned officer in charge of Environmental Health for Madigan, following a recent training where half the team did a full gear exercise. 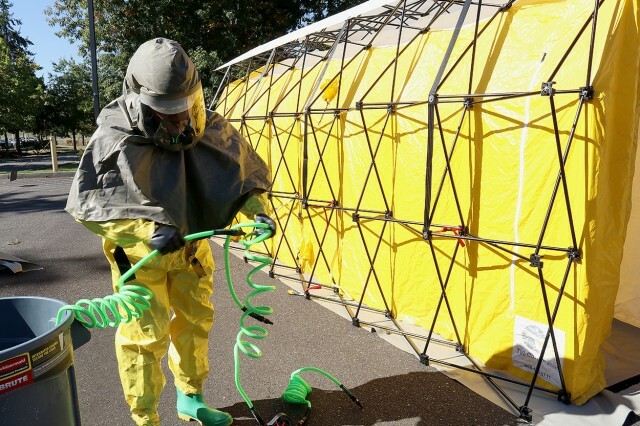 Army-wide, decon teams are housed under the auspices of preventive medicine departments. Madigan's is staffed with Soldiers from across the medical center who are chosen by their service line's deputy to perform the task as a special duty. The full team consists of two smaller teams each made up of about 20 people. "There are Soldiers from lab; there are Soldiers from X-ray; there are Soldiers from preventive medicine; there's medics out there. It's a team made up of all the departments within Madigan," said Davis. 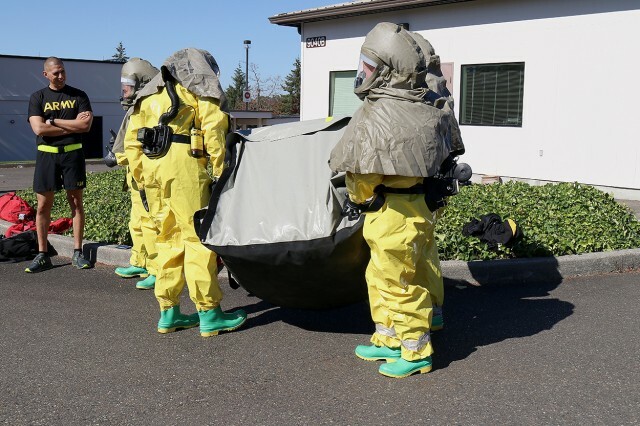 Part of the reason for a large team is the personal protective equipment needed to shield a team member from becoming contaminated themselves is cumbersome, tiring and hot. In order to be waterproof, the suits are made of synthetic materials. Read: Not exactly breathable. 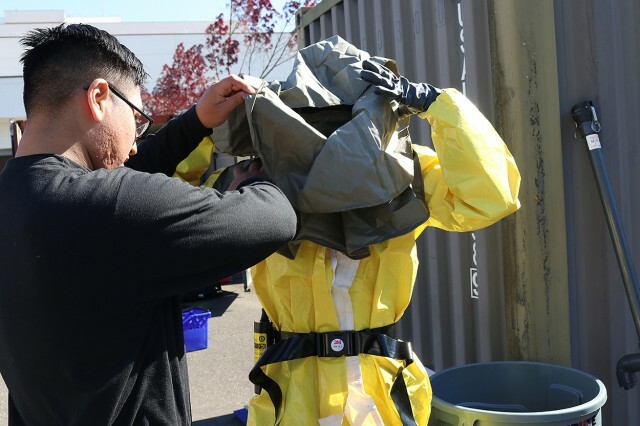 They have hoods, boots and the individual is taped inside to provide an impenetrable barrier against hazardous materials. "They have a special ventilation system so you can maneuver in them and breathe in them," Davis explained. "It looks easy when you're out there doing it, but even after 30 minutes of work, it's tiring wearing that suit and moving around in that." 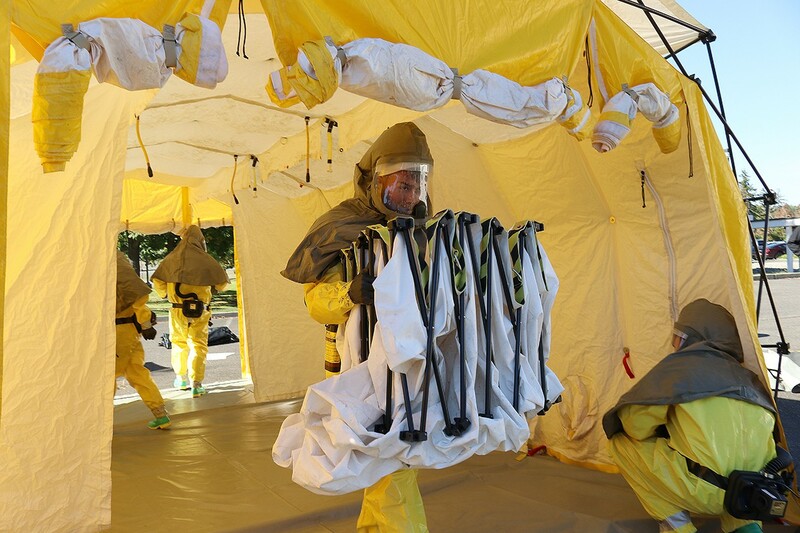 After donning the suits, the team sets up a wash tent. 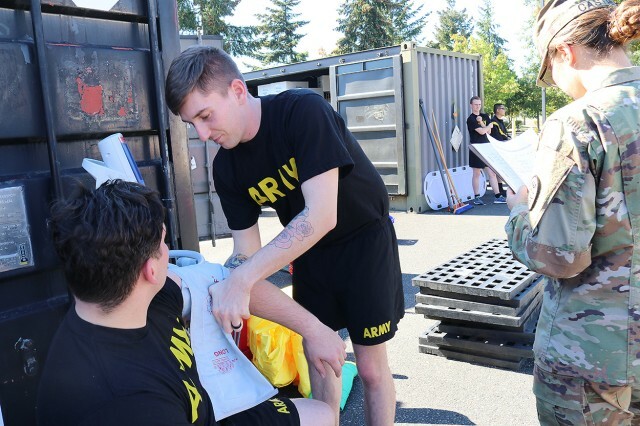 The Soldiers must move the roughly 4-foot cube from the storage containers in the Emergency Department parking lot to an open spot and unfold the tent from its accordion position into a tunnel, setting a center pole. Then, panels and a track with a platform and roller system are constructed to created separate compartments. Finally, hoses are hung and attached to a water heater that looks like a generator. That is, in turn, hooked up to the fire hydrant. 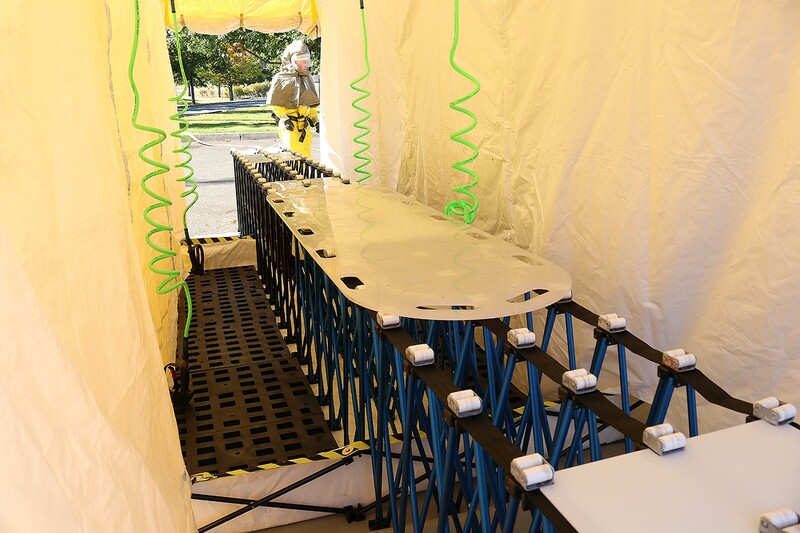 "It's a three compartment tent where you can serve two ambulatory and one litter patient at a time," said Davis. "The two outsides are so that ambulatory patients -- patients who can walk -- they can go in, they can undress themselves, and they will shower in there. There are water hoses that hook up to it. One would be for soap and one would be to rinse after. And they would wash themselves and then there's another section where they can get dressed. The big middle aisle is if a patient is on a litter. We have rollers they can come through on and then we have our team members assist in washing them," she continued. 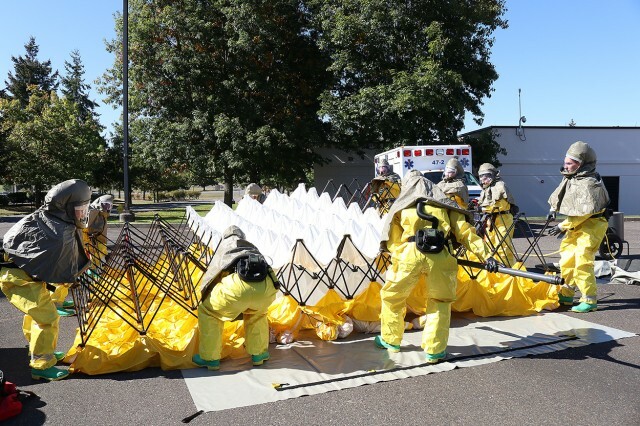 Much like a bath that water fowl get when they are caught in an oil spill, patients who need decon are washed down with regular dish soap. Helping to clean patients while wearing these suits is challenging, but one of the most difficult aspects is communication. Once in the hood with the ventilator running, it is tricky to hear. "The first time when we went through setting up the tent, we did it without our suits on so that the Soldiers could learn who does what and what signals to watch for when putting up the tent," said Davis. Two additional factors aided in clearing that hurdle -- camaraderie and attitude. Many members, even those who had not trained together on this team, already knew one another. "We didn't hear anyone complaining about anything. Everyone was motivated and just ready to do the training," said Davis. 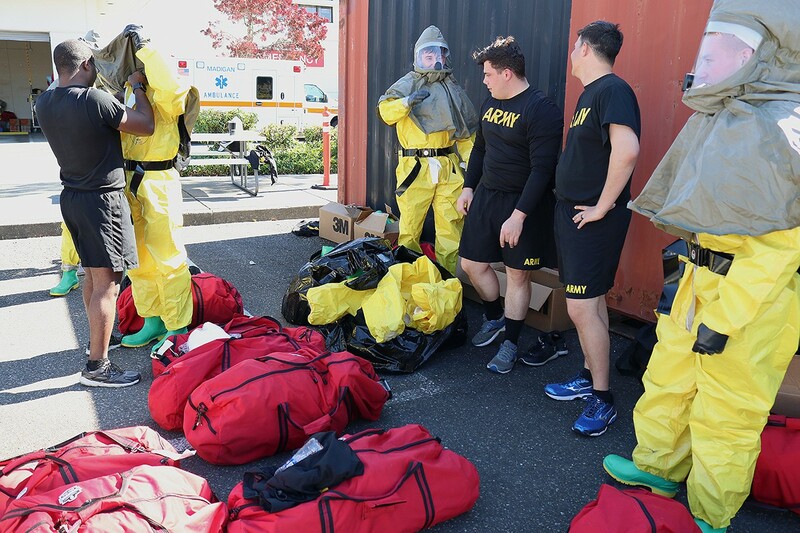 In addition to drawing its members from across the facility, the team makes use of knowledge and experience wherever it can be found. 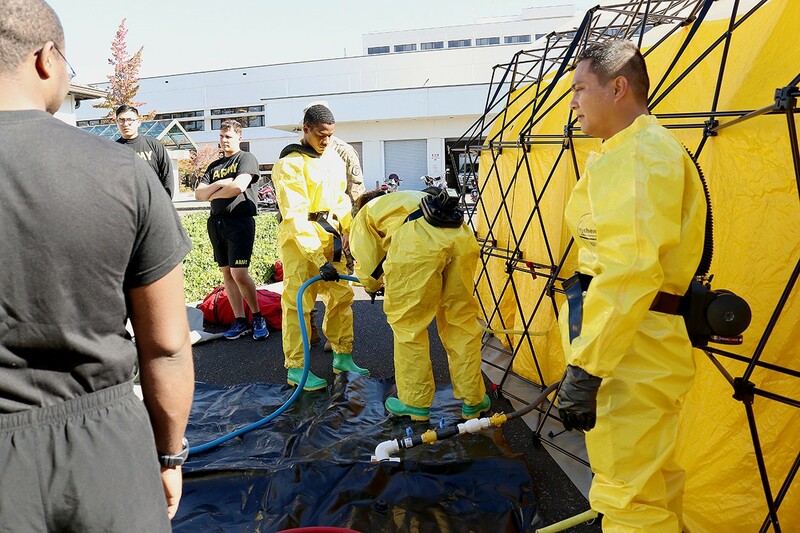 Maj. Thomas Costeira, Madigan's radiation safety officer and the chief of Health Physics, honored a request to bring his knowledge of the equipment and set up procedures to the exercise. 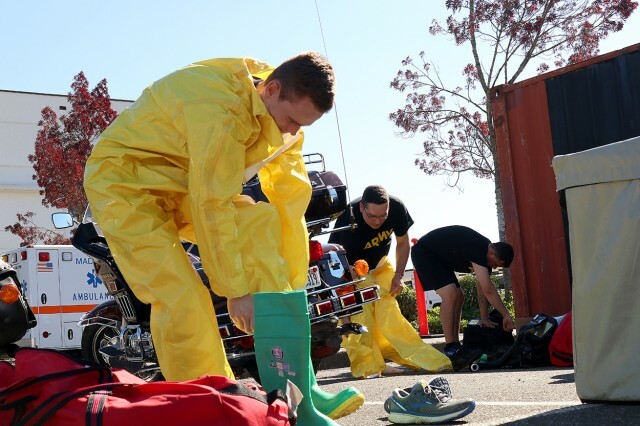 He has led a decon team in the past. Davis noted how valuable that mentoring was, noting that he, "gave some great input on our tent setup, and he definitely knew the equipment. So, he was able to assist in making sure how we had it set up was correct." As Davis is still new to the team, she can't say she feels comfortable in the suit yet. But, it feels familiar. That was the goal of this training. The next, progressive steps in the training outlook are to work on actual casualties, whether actors or mannequins, to advance proficiency. After that, Davis and the team officer-in-charge, Capt. Rochelle Castro, an advanced public health nurse, want to get standardized, meaning an evaluation team will come in and observe the team in action to determine whether they need more training or if they are fully proficient. No matter where the team is in its progress towards reaching its highest training goal, continual training is a given. Readiness comes with practice, after all.